It feels like I'm starting to settle back into normal life, but what a heck of a vacation. Some of it amazing like visiting new friends at the Oregon Fruit Factory in Salem and watching a local river run the wrong way in a wild windstorm. Some of it annoying, such as picking up garbage on every beach and staying at a cramped KOA while beautiful Fort Stevens State Park tantalized us from across the street. Then there’s the gross. Idiots using an RV dump site in a disgusting way and a crazy female with a completely packed Ford Explorer. Not packed with luggage, but packed with raw chicken wrappers and other rotting food garbage from front to back. Perhaps a call to the state mental hospital was in order now that I think about it. I’ve got tons to share, but for now I leave you with pie. Really good pie. Although I’m not sure it can beat Dishboy Scott’s pecan version. That pie is amazing. 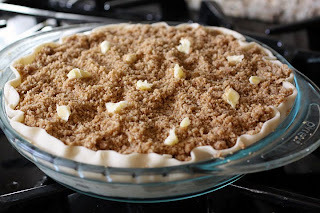 If you prefer a traditional pie skip the crumble topping, dot with butter and top with a second dough. 1. Set the oven rack to the lower third and preheat to 375 degrees. Place the pie dough in a 9 ½ Pyrex deep dish pie dish. You’ll have to gently roll store pie dough between sheets of wax paper to make it an inch or so bigger. Don’t flute the dough. Place dish with dough in the freezer while making filling. 2. Mix 1 1/2 cups granulated sugar, 1/3 cup flour and 1/8 teaspoon salt together in a small bowl. Do not skip this step or your pie will have flour lumps. Set aside. 3. Toss the rhubarb, raspberries, apple slices and lemon juice together in a large bowl. Toss in the sugar flour mixture. Set aside. 4. For crumble topping: Place walnuts in a bowl and microwave in 30 second increments until toasted, 1 to 1 ½ minutes. Move walnuts to a food processor bowl with brown sugar, flour and salt. Process until nuts are very fine. Add the butter and process until the mixture is crumbly. 5. 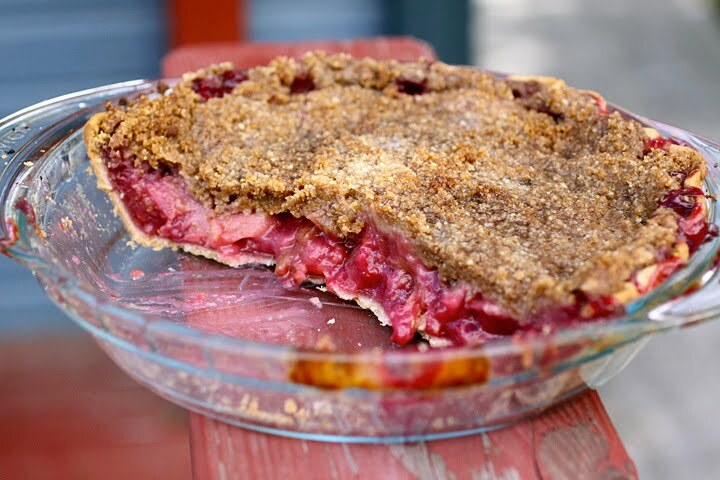 Add the fruit to the unbaked pie shell and spread to even out. Evenly crumble on the topping and dot with butter. 6. Bake for 45 to 50 minutes or until topping is golden brown and fruit is bubbly. If you have one, place a pie shield on 20 minutes in to baking. Check pie about halfway through cooking time and cover with a foil tent or lay over the pie shield if it looks like it’s starting to burn. Cool before serving. What a crazy, yet normal sounding camping trip! You never know what you're going to get when you use a KOA. Oh how I love both of these fruits you've chosen in this pie- what a wonderful combination with a crunchy topping. Love to give this one a try. Welcome home. Hi Cristie!! Thank-you. It's kind of nice to be home. I hope you're doing well over there! Whoa-dee, Laura. That looks amazing. Sounds like you had quite the adventure and can't wait to read all about it later :). Welcome home! I hope you'll be sharing more of your vacation with us soon. I'm glad you added a printer version link--very good idea! Oh, you must check out what happened to the wedding cake I made July 3rd. It was horrific. It sounds like you had quite the trip! I love seeing this pie...it makes me crave a piece with a scoop of vanilla bean ice cream. Welcome home, Laura! That sounds like SOME trip....an adventure for sure. This is what I call my kind of pie.......fruit and crumble on top....MMMMMmmmm!!! These are sinfully delicious pies. This pie has something for everyone! Sounds like you could write a whole post devoted to your vacation happenings! This pie looks great... I love the crumble topping! I have never had rhubarb and it looks like I may just have to try it. This looks wonderful. Sounds like you had a very nice vacation. Welcome back! anyway...on a food note, i was just telling my friend yesterday i needed to get my hands on some rhubarb! i grew up in the midwest where it grew everywhere and i've yet to find a good source of it in oregon. sigh...i'll have to start looking again and give you my strawberry, ginger, rhubarb crisp recipe. If I could leap into the screen right now, I think I'd eat that whole pie. Oh Laura, wish I'd had this recipe last weekend when I had leftover rhubarb - one of my favorite things - from the ice cream I made. Just another reason to buy some more. Oh my gosh yes...we are big campers too and avoid KOA at all costs! LOL! Haha you have me intrigued about your trip. :) The rhubarb looks amazing esp w. the walnut crumble on top!